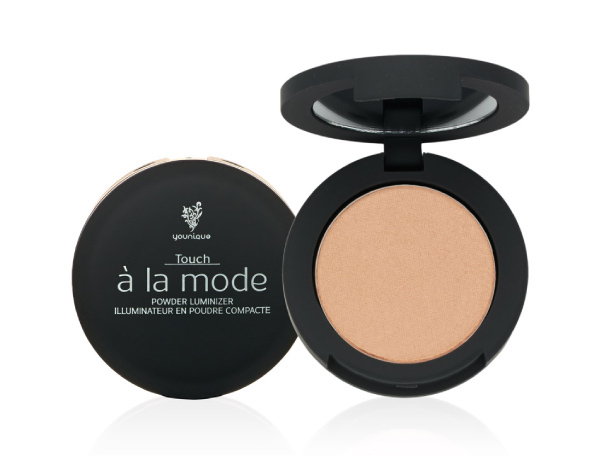 Brush on brilliance with Touch à la mode Powder Luminizer, a rich, pressed-powder highlighter with an extra lightweight finish. Light-diffusing, multi-toned pigment pearls adjust to your skin’s natural undertones while rich emollients help condition your skin for a smooth, flawless-looking appearance. Apply along cheekbones, the bridge of your nose, Cupid’s bow, and brow bone. After applying lip gloss or lipstick, dab along the center of the lip for fuller-looking lips. Using the Fan Brush, sweep across face, neck, shoulders, and décolletage for a light, all-over luminosity.